Today, I'd like to honor my Mom Nancy Nicholas. It is "Mother's Day" here in the USA and I couldn't be happier than to share my Mom with all of you. My four sisters and I and her grandchildren have been so incredibly fortunate to have the most wonderful mother and grandmother in the world. Mom is 81 years young now. She just came back from a trip to Amsterdam with two of my sisters - Nancy and Laurie. 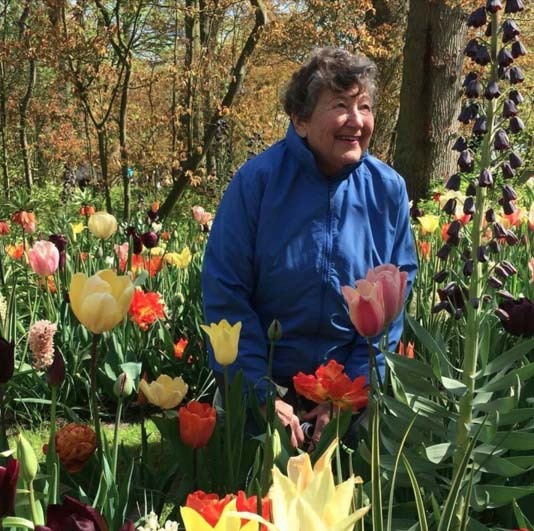 The photo above is of Mom at the tulip gardens at Keukenhof. Doesn't she look so happy? Love this photo. Mom is such an inspiration to me. When we were younger, our house was the place everyone wanted to come to. Mom always welcomed our friends in with open arms. Over the years, she also opened our home to so many people, including many foreign AFS students who also consider her their Mom too. That's why Mom went to Holland - to visit Daan, our AFS brother from the early 80's. Mom was lucky to find the love of her life in my Dad Arch. They married when she was only 21 years old, like so many women did in the 1950's. They built a loving family and home together in northern NJ. Mom was always there for all of us. As a mom of only one child Julia, I really do not know how she did it all. Getting us all out the door in the morning, brown bag lunches in hand, had to be one mean feat. There was always chaos and confusion which she seemed to thrive on. The laundry might not have always been done but we always felt safe and loved and supported. The most important gift she gave to me was her love of creativity, color, textiles, and gardening. She was always encouraging us to make. She always wanted a handmade present, not a store bought one. When I was 9, she asked our teenage neighbor Robin if she would teach me to sew since I had expressed interest. Mom was smart to pass off the teaching to a cool, older teenage girl. Mom was busy with the day to day of raising five girls and running our household. She also knew that Robin would be just as good at sharing her sewing knowledge and that I looked up to Robin. Another thing Mom taught me was to try to purchase the best quality materials that you can afford as they would be much easier to work with and would last longer. She opened up a charge account at the local fabric store (no credit cards in those days, if you can believe). She taught me how to match thread to fabric and how to read the back of a paper pattern to figure yardages. She let me purchase all the sewing supplies - fabric, paper patterns, threads, interfacings, and more that I needed to make my own clothes. In those days, you could save serious money sewing for yourself. It was before the rise of imported cheap clothing. That faith in me to watch the pennies but to give me the freedom to continue to create and sew and learn, try harder and harder projects, put me on the path to the career I have had. Mom taught me to be frugal too. She came from Scottish ancestry and Daddy used to tease her about being "scotch". Here in New England being frugal is considered being a "yankee." With my scotch training, I fit right in. As I got a little older, Mom took it upon herself to start a 4-H club we called The Tasty Basters (cooking and sewing - clever huh?). Through that weekly club, she spread her knowledge of sewing and cooking to so many other girls in our town. I'm sure most of them still use those skills. Although I didn't learn my gardening skills from Mom as a child, I did learn many different perennial plant names. I knew that the garden and plants and nature were something that was important to her and Daddy. They were such enthusiastic gardeners, growers of delicious vegetables and fruits and lovers of color in nature that they couldn't help but pass that passion onto all five of us. Gardening by example I suppose. When Mark and I moved into our first apartment, I was on the phone to her with gardening questions. Every time I went home, she would be out there digging up perennials for me to take back to my own garden. Daddy passed away over a decade ago. I have seen Mom move through the challenges of the last decade. It was all new for her - living without my Dad. She arose to the challenge. She raised my two nephews Nicholas and Francisco when they came to live with her from Brazil. She got herself a dog - a French Bulldog named Lola. She continues to be a mad gardener - perennials, annuals, herbs, veggies, and fruit. She says it keeps her fit and strong and I am sure she is right. She has continued her volunteer work with her church and community. Mom has been so strong and solid and such a role model for me, for my sisters, our husbands, my nephews and nieces, the extended family, and her community that has been her home for over fifty years. She has been such a fantastic part of Julia's life and I am so happy that Julia has been fortunate to have her in her life - cheering her on from the sidelines. What a wonderful story and tribute to your mom and all moms out there...including you! I'm so glad and honored to know you! Have a great Mother's Day!! Yesterday the postman delivered your book "Crafting a colorful Home". I ordered it here in the Netherland and I love it. The pictures are so great and in the coming days I'read if. Thank you for sharing this lovely tribute with us, Kristin! Happy Mother's Day to you too! Happy mother's day to you too!!! Beautiful history about your mom and her journey! Beautiful tribute to your amazing mother! What a terrific lady...you are so fortunate. My mom was an AFS mama too! I think I would love your mom. Someone who appreciates the simple life. Happy belated to you both. And a HAPPY "belated" MOTHER'S DAY to your Mom! Mine will be 81 in a few months. And would kill to be in that Garden! Mom went outside for a few minutes before sundown to "survey" her garden, and promptly snipped said Flower and brought it IN. [It was below Freezing last night] - However, not because of the threat of Frost. But, because, she couldn't SEE it from INside the house and, "...why should the Neighbours ENJOY it when I can't!?..." -- It's presently in a bud-vase on the kitchen windowsill where she can constantly see it! What a beautiful tribute to your mom! How blessed you are to have her!!! I teared up reading this. Thanks for sharing!